When I was tromping down the rocky trail at the Columbia Icefields, completely furious, heartbroken, and with tears in my eyes, I knew I needed to write this. Let me tell you about an experience I had in September of 2018, that solidified my feelings towards global warming, climate change, melting glaciers, and human impact on our environment. We were halfway through our Canadian Rockies road trip and taking the drive from Banff to Jasper, on the Icefields Parkway. Halfway between the two are the Columbia Icefields! The Columbia Icefields are a complete marvel to see in person; with peaks towering above and an icefield (which is the toe of a glacier) winding up to meet the skyline like a river. I can’t imagine what the first people to discover this place felt when they first laid their eyes upon it. In present day, it isn’t the solitude filled place that it assumedly was in 1827 when it was discovered. Walking into the visitors center felt like walking into a busy airport, with people waiting in long lines to purchase overpriced tickets to ride the “Ice Explorer”, and people spending more time in the gift shop purchasing their badges of travel, than actually experiencing the place they were at. We quickly stepped out, feeling overwhelmed, and decided not to buy a ticket to get up on the ice fields and closer to the Athabasca Glacier. We instead chose to hike the short toe of the glacier trail to get as close as we could on foot. 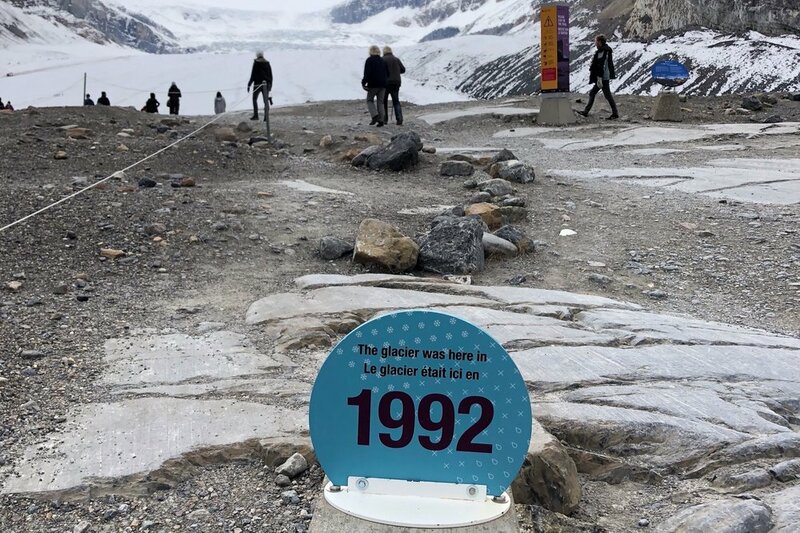 Walking up the trail, there are markers with the year that the glacier’s edge was at each point. It was humbling to physically see how much it had receded in just my lifetime. Most people waltzed straight past each informational sign, eager to get to the viewing point. Upon arriving at the end of the trail, there were many signs that clearly stated not to cross marked boundaries, as travel beyond that point is unsafe. (We’re talking about falling into crevasses here.) There were also signs that stated not to build cairns. (Cairns are those rock stacks that for some reason, became a trendy photo subject on social media, so now everyone builds them for the sake of an Instagram photo). A quick side note: cairns are dangerous for a number of reasons. Their main purpose is to be a marker for where to go when there’s no trail, so building these in random locations can potentially lead people astray, causing them to get lost. Moving rocks around also increases erosion by exposing the soil underneath, which can affect native plant growth. Additionally, insects and mammals burrow under rocks for protection, so you may be affecting an animals home, or reprieve from the elements and predators. In regards to the protection of our environment, I’ve honestly never seen more blatant human ignorance in my life. At the top of the hill was a sea of cairns, and beyond that, was countless people walking straight past the “do not cross” signs, under the ropes, and down to the point where the rocks end and the ice begins. My group began to get angry, realizing how disrespectful so many people were being to not only the fragile area, but the rules set in place for it. It was infuriating. We began to read the signs loudly, hoping that in some sarcastic and passive manner, people would realize they weren’t supposed to go under the ropes. Still, not one single person stopped. The scenery was world class, but we were too distracted by the disregard for protecting the area to truly enjoy it. We got the idea to start kicking over some of the cairns, and soon it became a mission to dismantle every single one in the area, in hopes that people wouldn’t see them and want to build more. (We also hoped that people would see us angrily kicking them down and realize that they weren’t supposed to be there in the first place.) We walked around the entire area, kicking them over left and right, each one fueling our anger further. We only talked to one couple from Oregon who noticed what we were doing and agreed with us about how upsetting it was to see people disrespect our wild places. Because NEWSFLASH, unless we can figure out how to inhabit Mars, this earth is all we have, and it’s all our future generations have too. Video courtesy of Abby Muir / @abbymphoto. We locked eyes on the final stack of rocks. At this point, I was emotionally enraged. I stormed up to it, and in front of an audience of people, I pushed all the rocks over and stomped away. I’m sure I was making a scene but at this point, I didn’t care. After this we began to walk back down the trail, and I could feel tears welling up in my eyes. I felt embarrassed to be crying over rule breakers and rock stacks, but it actually broke my heart to see such a beautiful place be destroyed even faster than it already has been by the effects of global warming. I felt the urge more than I’d ever felt before, to make it known that this behavior towards our environment was just 100% unacceptable. At this point I knew I needed to do more than just dismantle rock stacks and make snide remarks to passing strangers, which is why I’m sitting here writing this post now. My time at the the Columbia Icefields is not the only time I’ve personally experienced this. On a 24 hour trip to Mt. Rainier in July, I watched a photographer doing an engagement session cross ropes alerting hikers of the fragile alpine meadow that was being rehabilitated, picked up plastic water bottles and trash, and watched a group of people walk past a “do not pass” sign for a photo when there was a place they were allowed to stand, maybe 30 feet away. I’ve also watched people fly drones in Banff and Glacier. These are just a few examples of how many times I’ve seen people disrespect the land. People walking right past a do not walk sign. About 30 feet to the left was a place where you could stand to take a photo, and it looked exactly the same! So, how did it get this way? The rise of social media has greatly affected the way we treat the outdoors. I’ll be there first to tell you that I’ve been so inspired to get outdoors and hike through what I’ve seen others post on social media. 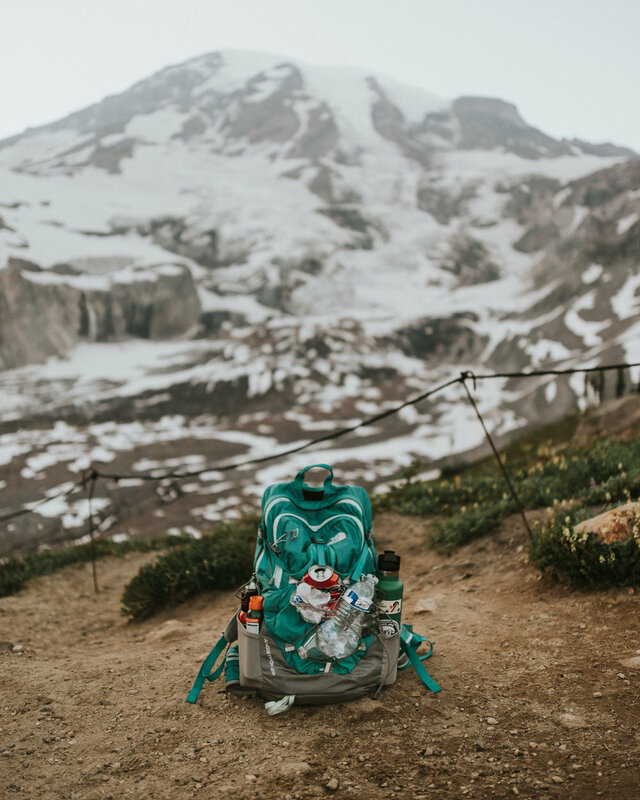 Instagram is an incredible tool for discovering new places to visit and new trails to hike, but it comes with many repercussions to our environment. Most people who find these places online are either not educated on what precautions to take when you’re visiting them, or don’t do the research to learn what they should and shouldn't do when visiting protected places. Geotagging allows us to view exact locations of where a picture was taken. This creates a huge problem because not only does it increase the traffic in these areas, but someone who doesn’t know any better could see a photograph of a glacier on Instagram, decide that they want to go see it for themselves, and then walk all over it for the sake of getting the same exact photo they saw on social media. By geotagging our photos with specific locations, we’re literally giving others the roadmap on how to to get to them, but not equipping them with the tools to visit them responsibly. The bottom line is that the rise of the adventure lifestyle on social media has seriously impacted our protected areas + wild places. So here’s how it sums up: most of the participants care about protecting public lands, but 1/5 of them would still cross a park boundary for a better photo, and half feel like they could probably learn more about how to protect public lands and practicing Leave No Trace. When I looked at these results I saw it as an opportunity to educate that 50%, and if even one person learns something from this post and changes how they interact with protected lands, then writing all of this was worth it to me. Okay. So you’ve heard my personal experiences, and seen how social media has negatively impacted the environment. Not convinced yet? Let me hit you with some cold hard facts. According to National Geographic, glaciers are melting at such an extremely rapid rate that some studies suggest that the Arctic could become ice free during summers by 2030, if the trend of global warming continues. According to NASA, Greenland is losing about 100 billion tons of land ice every year. Glaciers in Glacier National Park shrank by more than one third between 1966-2015. Grinnell Glacier, located in Glacier National Park, lost 45% of it’s footprint (100 acres) between 1966-2015. 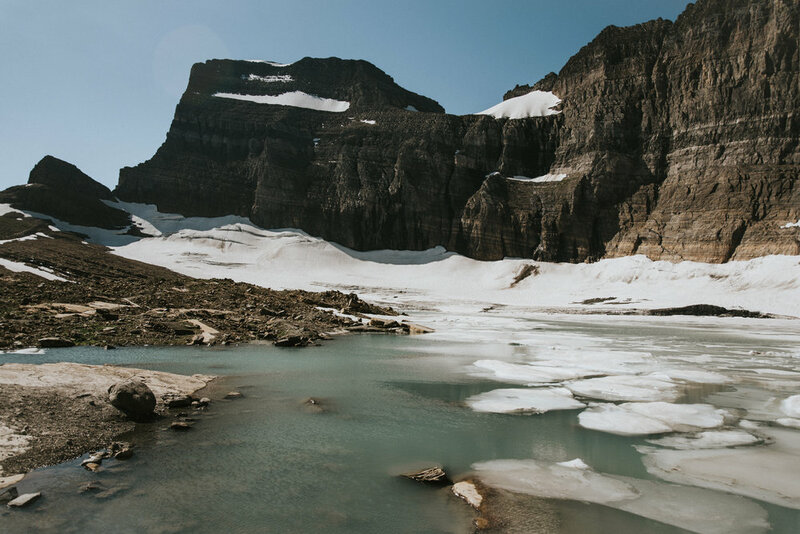 Researchers predict that all of the glaciers in Glacier National Park will be gone by 2030. The Grinnell glacier at the bottom, with the Gem glacier hanging at the top of the rock. The Gem glacier is the smallest glacier in the park at only 5 acres! The reason I highlight facts about GNP so much is because I’ve been there twice, and I’ve personally seen these changes with my own eyes. The halls of the historic Swiftcurrent hotel are lined with comparison photos of the glaciers in the early 1900’s vs. now, and the difference is shocking. I’ve hiked to the Grinnell Glacier and within 5 minutes of arriving I saw a chunk of ice break off right in front of me. When I first heard that all of the glaciers would be melted by 2030, which is in just 11 short years, I realized that that’s within my early life. That scares me, and it should scare you too. If you don’t agree with the negative impact that the previously listed activities have, then the financial repercussions might deter you. 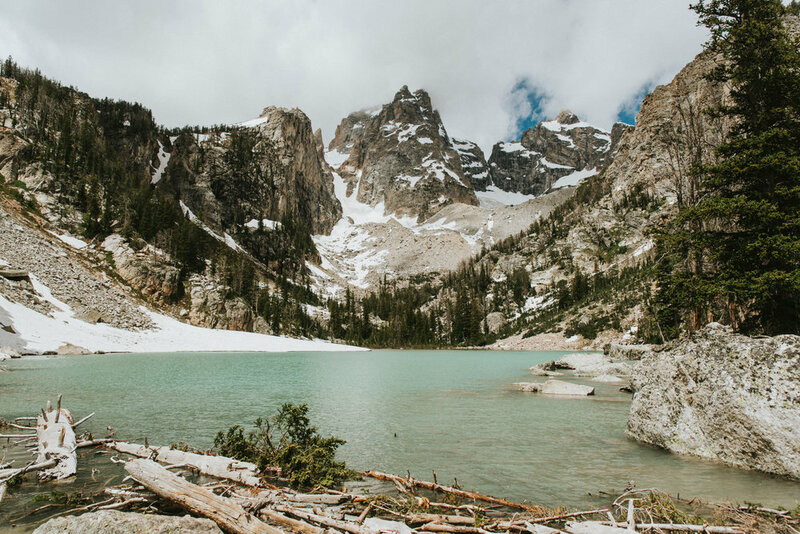 You can be fined by the Parks Service and banned from the area by doing any of these things, or breaking any rules specific to the park or wilderness area you’re in. Amounts can vary, but based off of multiple articles I’ve read, one person was fined $1,600 and banned for a year from Yellowstone for flying a drone, another was fined $2,000 per artifact stolen from ruins in Colorado (they stole more than 40 artifacts), and another was fined $15,000 for dumping waste in the Nisqually River at Mount Rainier. There’s plenty of things we can do to prevent the deterioration of our planet. For me, my focus has been mostly on the protection and conservation of national parks and public lands, because this where I’ve experienced so much of it on a personal level. So, I want to expand more on how we can visit these incredible places responsibly, and leave them better than we found them, therefore contributing less to climate change. Additionally, park rangers and officials are fantastic resources. When you enter a park you have to pass through an entrance booth, so please take that opportunity to ask any questions you might have! The Parks Sevice is also really good about listing all of the information you might need on their website. Additionally, it’s very easy to find a ranger in US parks (they hang out on all the trails and in the visitors centers! ), and they’re more than happy to inform you or answer your questions. If you pack it in, pack it out. This goes along with LNT practices, but anything you take into nature was not meant to be there, so make sure you bring it back out. Trash, food scraps, toilet paper, you name it! And just because your orange peel is biodegradable, doesn’t mean it won’t take years to fully degrade, or that it was meant to exist in that environment. Treat the outdoors like you would treat a guest room at a friends house or a hotel. Leave it better than you found it! Do not geotag specific locations. Unless the location is incredibly obvious based on the photo (hello, Moraine Lake), use more generalized and less specific tags. For example, if I were to post the photo above of the Grinnell Glacier, instead of geotagging with “Grinnell Glacier”, I’d geotag with “Glacier National Park”. I know how satisfying it is to brag about the cool place you went, but trust me when I say that it is not worth encouraging others who may choose not to educate themselves on how to visit responsibly to go there too. If someone really wants to go to the place in your photo, they’ll do the research to find it themselves! This filters out the people who just want to know where it is so they can go take the same photo, and allows the people who really care to visit that place for the experience to find it. And let me tell you, it is the most satisfying thing ever to do the research to find places off the beaten path! Save some space in your backpack to pack out trash and litter! You’ll be bettering the environment, and setting a good example when others see you doing it. Choose not to go to prohibited areas just because everyone else already has. Your thought process might be that the damage has already been done, but contributing to the damage just makes it worse, and it gives others the signal that it’s okay for them to do it too. It really all goes back to setting a good example for others, and educating people where you can so they can understand the negative impact their having! Dismantle cairns that aren’t used to aid in the direction of travel on unmarked trails. I mean, maybe don’t make quite as big of a scene as we did at the Columbia Icefields. 😉 Or do! But either way, dismantling them means less people are encourage to build them. Stay on trail! I know you really want to venture off to get that cooler photo, but the more we walk on already laid footprints, the less we create new ones, and therefore the more of the land we can preserve. Basically, don’t do anything you’re not supposed to “for the better photo.” Your Instagram feed is not worth the deterioration of our environment. And finally, share this post, and posts like it, so that more can educate themselves and be better equipped to visit our public lands responsibly! Please remember that the Parks Service was originally created to protect our wild places for generations to come. Let’s not ruin that by contributing to their deterioration. The entire reason that the Parks Service came to be in 1872 was to prevent settlement, mining, and commercialization, so that our untouched landscapes could be enjoyed and protected. But every day, thousands choose to partake in activities that are destructive to these places that we wouldn’t even have access to in the undeveloped condition that they’re in, if it weren’t for the Parks Service in the first place! Think about how ironic that is. We are so so lucky that these places have been preserved for us, so let’s do whatever we can to keep them this way. I could go on an on about all of this forever, because I’ve become so invested in it over the past year. I’ll save you the further rambling by summarizing everything I’ve just said: practice Leave No Trace and other practices that are environmentally friendly, do your research, never break the rules of the area that you’re in for a photo, educate yourself, and in turn, share that education with others so we can all be better to Mother Nature. She’s important, and hopefully with our diligence, she’ll be here to stay for a long, long time. And finally, please don’t hesitate to ask me any questions, if you have any! I hope that I can be a resource of information on this topic, and I’m more than happy to help you find the answers you’re looking for, whether they’re generalized, or about a specific location. If you learned something new, or plan to put any of this information to use next time you head outdoors, leave me a comment! I’d be SO elated to hear that I made an impact on your outlook towards climate change and the preservation of our planet’s most beautiful places.